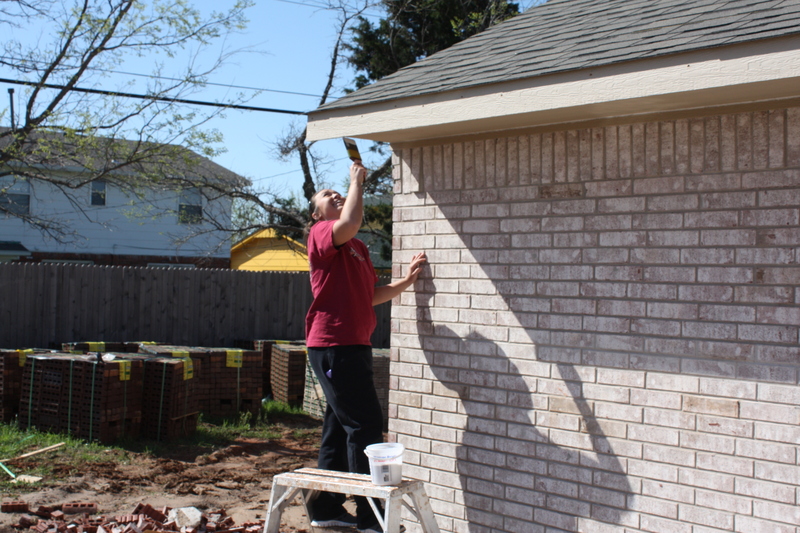 Paige Baker paints the exterior of a house that Student Senate helped get ready for its new residents. Photo by Amber Stafford. Rose State College Student Senate gathered at the Hope Crossing Community for the Oklahoma City Habitat for Humanity on April 19. “It was cool getting to do things for other people that are less privileged than me. Knowing I was a part of the difference in their life, that was awesome,” Paige Garrity said. The 24 student volunteers were split into two groups working on different houses with much needed work to do to complete the houses. Paige Baker helped paint the exterior of the house. “My experience with working for Habitat for Humanity was amazing. Knowing that I’m working for families’ that are struggling made me feel great,” Baker said. Karissa Combs was a part of another group that worked on the house, and helped nail up the exterior insulation around the house. “My experience was fun and fulfilling, knowing that I could do something to help in the community,” Combs said. The Student Senate and Student Activities have assisted Habitat for Humanity for more than five years. For more information on volunteering for Habitat for Humanity, visit http://www.cohfh.org. Habitat for Humanity is a non-profit organization, which focuses time and donations on building homes for those in need.